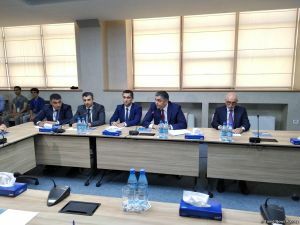 Construction of massive "Park of High Technologies" is underway in Baku, Minister of Transport, Communications and High Technologies of Azerbaijan Ramin Guluzade said May 17 at a conference organized on the occasion of the Information Society Day. The minister noted that, the center contributes to increasing the interest of young people in the ICT industry. "Today's event is held in the largest regional DATA center. The center is the safest in the region, which meets the Tier 3 standard. It allows government agencies to securely store data. At present, more than 30 enterprises of the public and private sector use the resources of the DATA center," the Minister said. The new innovation center "Park of High Technologies" LLC, as previously reported, will be put into operation before the end of 2019. The center with a total area of 7,000 square meters will be based in the Khatai telecommunication center of “Baku telephone communications” LLC. The building will house the head office of "Park of High Technologies" LLC, business incubation center, co-working center, laboratories and other facilities. Ten percent of the building area will be used for the needs of administrative management, and the remaining part is reserved for the activities of start-up projects. All IT companies operating in the center will be granted the status of residents, which will allow them to enjoy tax preferences.